Join a full weekend vegetarian cookery residential holiday, set on a beautiful organic farm in the Cotswolds, geared to make you a natural in the kitchen. The residential includes hands-on cookery and demonstration lessons and creating and sharing seasonal and organic feasts with great nights accommodation. Tea, coffee, herbal tea, and tasty homemade cordials will be available throughout the weekend and alcohol to buy in the evenings. Delight yourself and join an organic vegetarian culinary holiday! Abbey Home Farm is a 1600-acre mixed organic farm on the edge of Cirencester. Guests will stay in the brand new bedrooms, made of wood from the farm and nestled into the side of the wood, overlooking the vegetable garden and beyond. All rooms open up into a wide south-facing veranda and are en-suite, with under floor heating. The Organic Farm Shop will provide organic cotton bed linen, which is hand block printed in the farm's own tiny workshop in Rajasthan. There is a large communal space with a wood burner for eating, chatting and relaxing, as well as an outdoor fire for finer nights. Begin your stay on Friday early afternoon with a tour of Abbey Home Farmyard and its organic gardens, which provide the inspiration for the dishes created throughout the weekend. Then, settle in the kitchen for a cookery lesson followed by dinner. Rise and shine to the beautiful surrounding of Abbey Home Farm before joining your chef in the kitchen to learn the basics of a delicious and indulgent healthy brunch. Everyone has a place in his/her heart for a cooked breakfast, but these late morning masterpieces showcase seasonal vegetables. Short break then back into the kitchen to create a feast for the lunchbox. Busy lives means people often grab something on the go. Create soups, salads, nibbles and sweet treats are great to have on hand for a busy week and lazy weekend. Recipes will be inspired by what is available from the vegetable garden. After lunch there will be a break for you to relax and enjoy a walk in the woodland or a nice cup of tea and a book in the common room. After a rest, back in the kitchen to create a restaurant quality five-course meal based on flavors of the world. Learn the secrets of the influential flavors as your chef teaches you how to find your own ethnic flair. Rise and shine for a hands-on cookery lesson featuring green smoothies and quick breakfasts. Breakfast is the most important meal of the day and is often overlooked. After a short break, return to the kitchen for an inspirational cookery lesson on creating memorable vegetarian Sunday Roasts. Erin is a highly regarded cookery teacher who has a great knowledge of not only vegetarian and vegan cooking, but also, like abbey home farm, is a fervent follower of seasonality of ingredients. 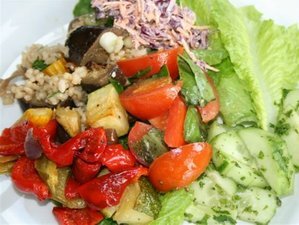 She is a professional vegetarian and whole foods chef who has been teaching cookery for over 15 years. She is also a gardener and brings to the table a deep-rooted belief in cooking from seed to plate. Erin is the founder of The Natural Cookery School, manages a community allotment in Tewkesbury and can also be found as a guest chef at The Organic Farm Shop. This hands-on cooking weekend will take place in the town of Cirencester, England. All meals are included during your culinary weekend. The Organic Farm Shop and its organic gardens will provide you the inspiration for the dishes created throughout the weekend. Soups, salads, nibbles, sweet treats will be part of the menu during this hands on vegetarian cooking holiday. The food will be mainly plant based including some dairy and eggs from the farm. Vegan and gluten free options are available, please notify when booking. Food is 100% organic. Start from the Norman Arch in Cirencester or you can start from the gate as above. The first half of this walk is on a permissive path through woodland, opened by Abbey Home Farm and Dillies Farm. 15 minutes on a minor road at the northern end of the route connects the permissive path with the public footpath, along the River Churn at the bottom of Perrots Brook hill. If you follow the woodland and walk through the wood to the totem pole, you will then find arrows that guide you along the farm trail, about 35 minutes in total. On this trail you can often see cows, sheeps, and chickens. It passes around open farmland and through Coronation wood, returning down the old railway line and back to the shop. Drive back to the traffic lights, turn right up the stow road 429, and turn first right down to the farm lane. 500 metres on the left park tight in to the hedge, and you will see the gate on the right with an arrow. This path goes up through Ragged Hedge Wood and then, past the newly discovered Long Barrow on the right. Follow the arrows across the field with the standing stone, past the grain store and back along the old lane to the car. This takes about 45 minutes on average. There is a short 10 minutes little stroll through the Yellow School wood, just down the farm lane. The Organic Farm Shop entrance is situated on Burford Road B4425, so if you are coming from Cirencester, Swindon or Stow using satellite navigation, put in Barnsley village and you will be on the right road at least. Bus number 51/151/51a runs between Swindon and Cheltenham via Cirencester. Bus number 881/885 runs from the station to Cirencester centre. Both Cheltenham and Swindon have mainline train stations. The nearest train station is Kemble, which is 5 miles from Cirencester. A number of national trails run through the Cotswolds. The Cotswold Way, The Thames Path, The Macmillan Way and the Monarchs Way all pass very close to The Organic Farm Shop. A wide number of taxi services are available from Kemble train station or from Cirencester. The Organic Farm Shop offers visits, tours, and courses in a friendly organic produce environment.